Don’t your knees hurt running all the time? I don’t know how you have the energy to do it? How can you run that long and not be bored? I’m not in shape, I could never do that! I have (insert problem) so I wouldn’t be able do what you do! I wouldn’t last even a mile running! I would get bored after ‘X’ miles/minutes! 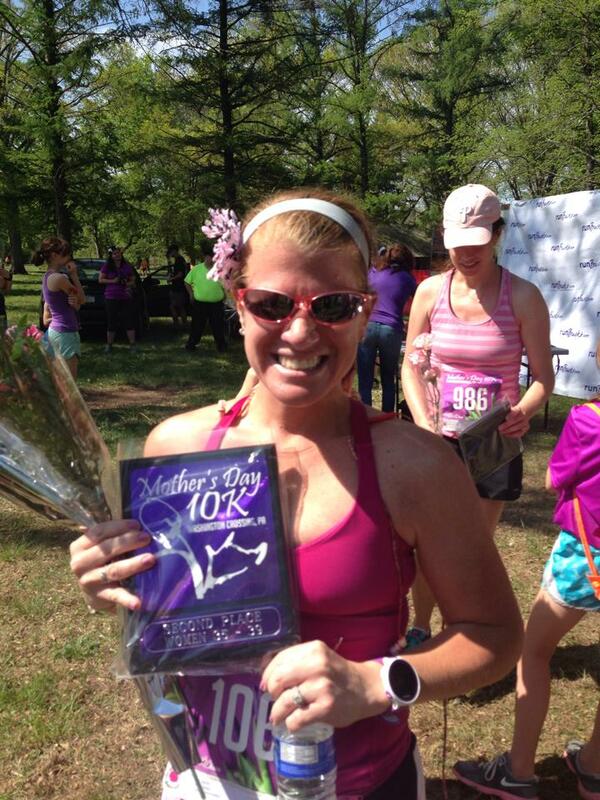 I never thought that when I started the Couch to 5K program that I would ever be a marathon runner? I didn’t. But I set myself a goal. Finish the 5K program. This program took me from being a non-runner to being able to complete a 5K (3.1 miles) in 9 weeks. It was hard. I had shin splints, I had a hard time with stairs for a while. I had to repeat week 5 at least twice. I struggled. But you know what? I finished. I was amazed I went from nothing to running a 5K. I had started a new habit of running 2-3 times a week and built on my progress from there. Now I run 5 days a week. Once I had run up to 3.1 miles it was time to get some real runner’s equipment. Shoes. I went to a local running store where I had my running gait analyzed by an experienced runner. Don’t concern yourself with looks and colors. Take their advice. Be prepared to spend a bit…but not too much…to get a good fitting shoe that will serve your needs. As I completed my Couch to 5K program I started to look at what I wanted to do next. I set my sights on completing a local 5 mile race that the local running club holds every Thanksgiving. It wasn’t easy, I didn’t manage to run the whole way but I completed the race with a decent pace (for me at that time). At that point that was the longest distance I had ever run. I then targeted what was is one of the major running events near me, the Philadelphia Broad Street Run. As part of my training I started running more and more 5K races to get used to racing and also as a dress rehearsal for ‘big events’. I’ve built up my race experience with longer distances since then. By Thanksgiving in 2010 I had finished my first race (the 5 miler) and had at that time lost around 20lbs. I headed for a family vacation in Florida and took all my new running gear with a goal of running 30 miles over the vacation. On my final day of vacation I ran 6 miles (my longest run to date at that time). I achieved that and made sure to reward myself. I hit up the Nike outlet for some goodies. I’ve used this success and reward cycle to keep building myself up. These successes were running 3 times a week, running 4 times a week, running 8 miles, running 10 miles. I’ve always made sure to celebrate in some way however small. Now after every marathon I treat myself to a new pair of shoes (typically just a different color of the same model shoe) as this inspires me to get out there and keep training. So having registered to run the 2011 Broad Street Run I continued to build on my mileage. 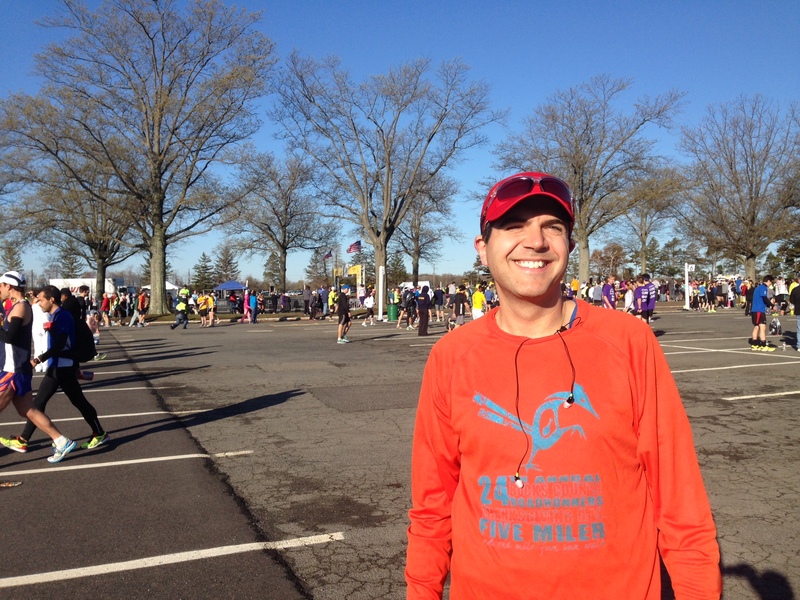 As I had recently completed 10 miles in training my wife encouraged me to sign up for my first Half Marathon (the Bucks County Half Marathon). It was held in Tyler State Park where I now do most of my marathon training although it was new to me at that time. The week before the race I decided to take a trial run to see how I might do on the course. I printed of a map and started running. Unfortunately I had the map upside down but it taught me how hilly the park was!!! So with only a couple of weeks between signing up and running my first half marathon I felt great that I took that leap (or push) and took that chance. Now it gave me the confidence for Broad Street. Every race distance I complete, every PR I earn now gives me the confidence to step up my game and toe the line for a new challenge. Now what? I had completed a Half Marathon, I had run Broad Street, what was next on the plan? I hadn’t looked too far forward at this stage as I had still been running for less than a year. I set a new challenge. Break 2 hours for a Half Marathon. I set my sights on another local race, the 2011 Rock and Roll Philadelphia Half Marathon. This meant that I couldn’t slack off during the summer as I was still a newbie and needed to build up again to a half marathon distance. This is what got me out of the door after Broad Street. Today I look to plan my race calendar for at least the next 6-12 months in advance so that I can plan my training, have set goals and keep myself committed. Early in my running as I was continuing my training and increasing my distance running I started to become more and more uncomfortable with my right knee and ultimately I went to see a doctor. I did not want to stop running but I was waking up in the middle of the night with discomfort and it was getting painful on my daily 110 mile round trip commute. 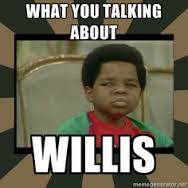 I was referred to a physical therapist who had me run on the treadmill and she analysed my problem. I was an over-pronator. Although I had stability shoes I needed additional support and was recommended for some shoe inserts (over the counter were sufficient for me). 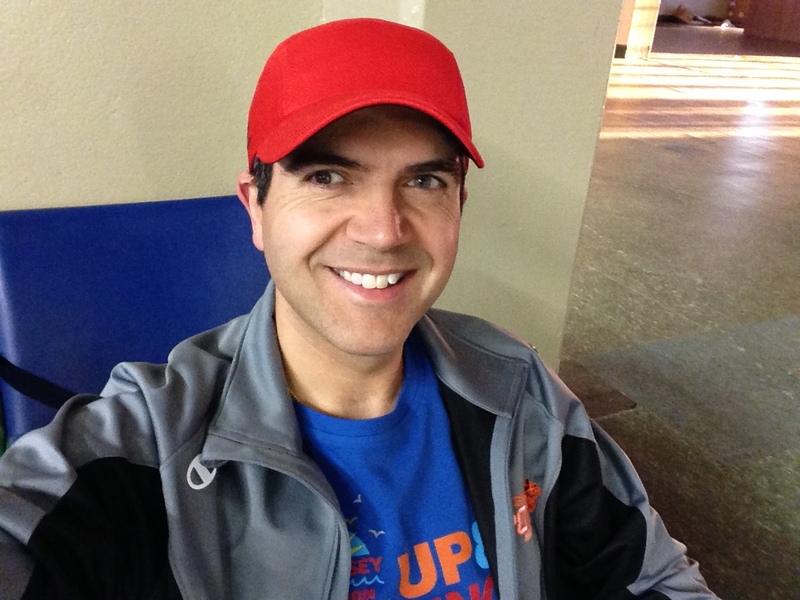 I visited the physical therapist for a 6 week period twice a week and performed a series of exercises to build up the stability muscles around my knees, to learn how to stretch and to focus on my running form. I was also recommended as part of this to get re-fitted for shoes which I did. I have been in Brooks Adrenaline shoes ever since. (Over time as my body has got stronger I have moved away from the need for the inserts and now run with shoes straight out of the box). By the end of the 6 week treatment I was stronger, my knees were aligned and I had a new focus on my running form that would go on to be a go to mental technique I now incorporate towards the end of races when I am getting tired. I was a fitter and renewed runner. I’ve learned to listen to the aches and pains when they occur and know when to rest and back off. I’ve also come more accustomed to the training. Where I once would have hurt or struggled for a couple of days after a long run I know how to self treat post run for better recovery. A lot of this is just experience and building up your own endurance. I also started reading about running and training methods. Through my research I came across Jeff Galloway and his ‘Run-Walk-Run’ method. Learning about the method and applying it in training and racing has enabled me to achieve goals that at the beginning of my journey seemed out of touch. His methods have also allowed me to stay pretty much injury free as it changes up the muscles I am using through the intervals and also has allowed me to recover quicker. After these little successes I set my sights on a bigger challenge, completing my first marathon. I signed up with the Runner’s World Challenge to run the 2011 Philadelphia Marathon which provided me with a training plan, supporting community and a daily e-mail providing encouragement (plus a cool shirt and a book on road racing). Training for a marathon is a life changing experience. Never did I think that setting the alarm for 3am, strapping on a headlamp and a reflective vest would be something I would do but you get to a point where your habit becomes your lifestyle and something just ‘clicks’ and you do it because you want to do it. 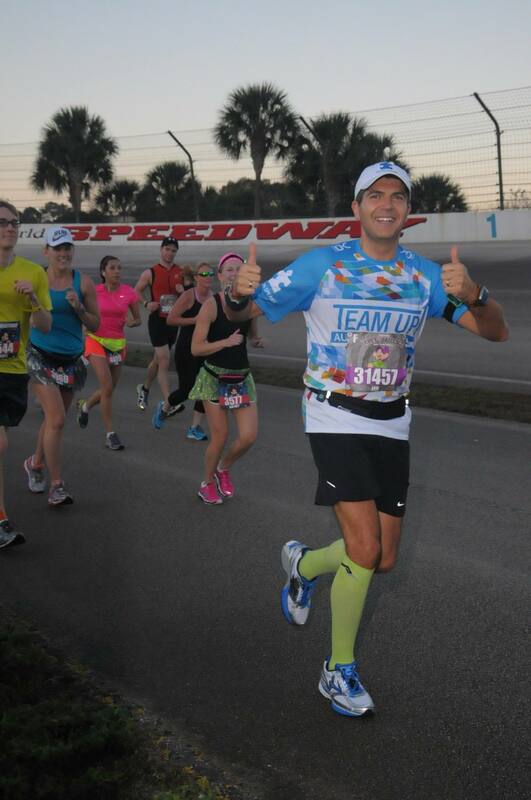 To date I have done 8 marathons (including a couple of multi-day distance events at Walt Disney World). It’s not just putting in the miles that makes be a better runner, I have to look after my body as that is my tool to achieve my goals. I had already started dieting to lose weight prior to starting running but to run distance you have to fuel right. It isn’t about cutting out calories for the most part I probably eat more than I used to these days but it is eating the right foods at the right time in the right quantities. It’s about keeping the metabolism going. I definitely eat more healthily than I used to. I seldom eat fried food or red meat anymore, anytime I do I definitely feel a difference. I seldom drink alcohol these days although I will partake in moderation. I guess that is the word, ‘moderation’. I still have a very sweet tooth. I look to satisfy my cravings with healthier alternatives but I also don’t beat myself up if I indulge from time to time. I journal all my food in the LoseIt app. I’ve been using that every day for almost 4 years now. It keeps me focused and in check. I also get regular chiropractic adjustments. I go every 3 to 4 weeks to visit Dr Bagnell who has seen me go from being unfit and overweight to 50lbs light with my current fitness levels and he has commented on how different and beneficial it has been to my overall health. It is like a regular tune up for my body. A little realignment goes a long way. I’m pounding pavement for hour after hour, then I sit at a desk all day and drive a car for at least 2.5 hours a day. If I didn’t get myself in alignment regularly I would just be creating problems for myself and lead to long-term injury as I tried to over compensate for any discomfort. Training pushes your body to the limits, but if you can maintain your engine then your body will be kind to you and your recovery will be faster. You may have noticed from some of my previous posts that I like to have fun when I run. 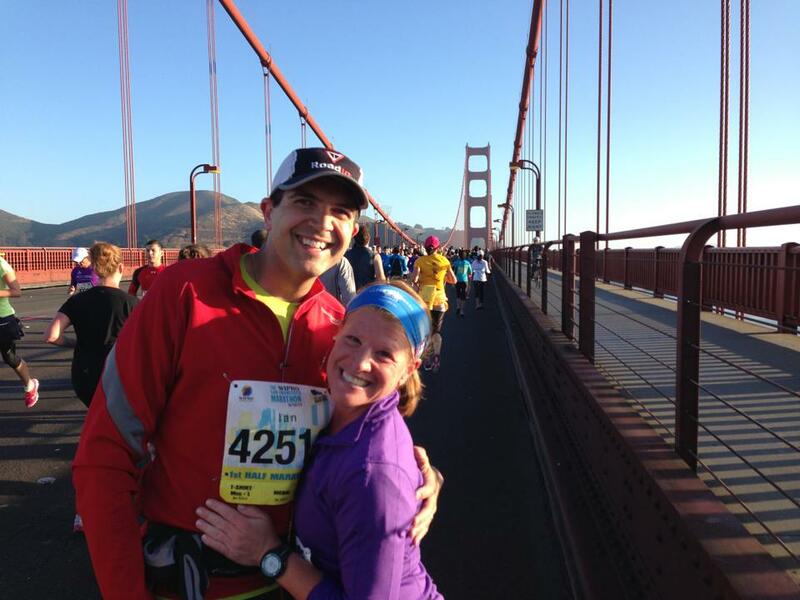 One of the best things that resulted from me running is that I get to run races with my wife. We are a good team. We both have somewhat different training schedules but we do run events together. I guess I am lucky that my wife is also a keen runner (we started within months of each other) and we get to share experiences together, visit new places and have a unique opportunity to sight see when we travel, for example running through all four Disney Parks at Walt Disney World, running along Niagara Falls and running across the Golden Gate Bridge in San Francisco. Running also happened to allow me to be a big kid again. I think you may have been able to tell that I am a big Disney fan. 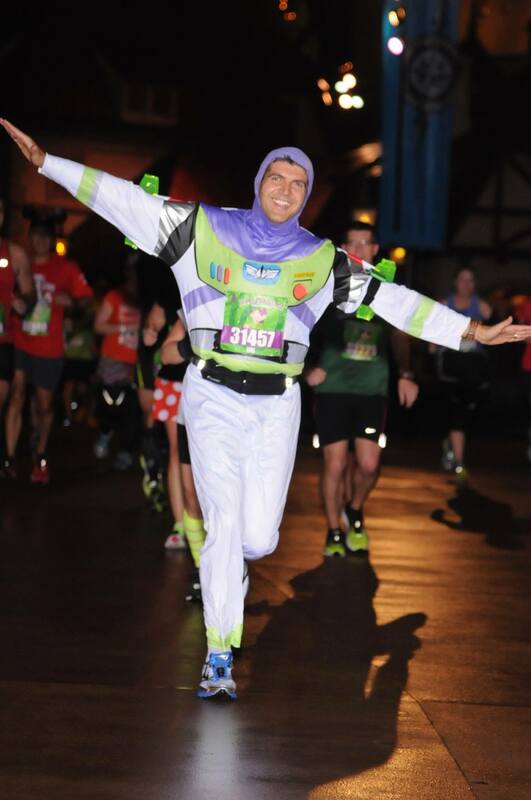 Well running has allowed me some unique experiences (through runDisney) like running races in full costume It has also enabled me to raise over $8,000 (to date) for charity. That’s how I got to be where I am and how I stay motivated. What do you do differently? Share your methods and motivations in the comments below. 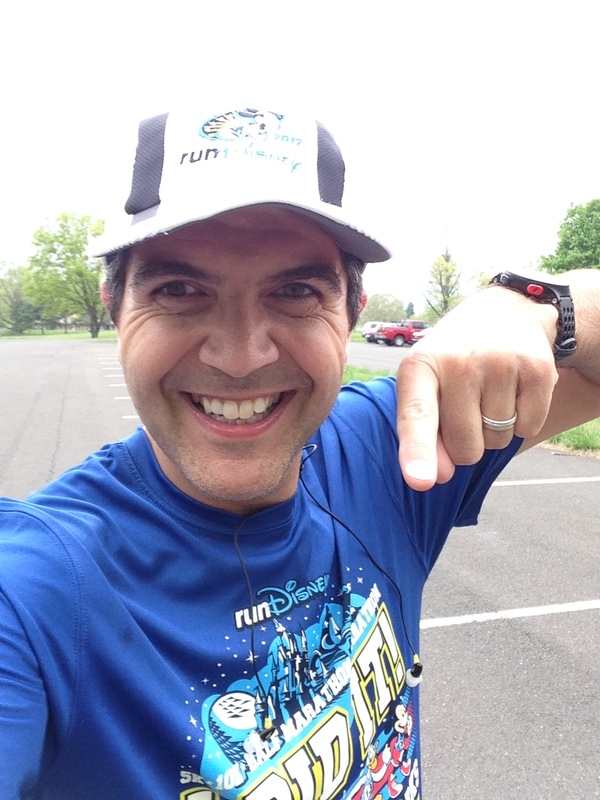 Coming off my recent PR earned (on the second attempt) at this year’s New Jersey Marathon I didn’t really have anything on my race schedule until the Baltimore Marathon in October and the Walt Disney World ‘Goofy Challenge’ next January. Both these races I will be running with my wife and so there are two goals: (1) In Baltimore it is to break 4:30 with Shari in her third marathon (we ran 4:45 together at the 2013 Philadelphia Marathon) and; (2) To successfully complete the Goofy Challenge still upright and smiling. 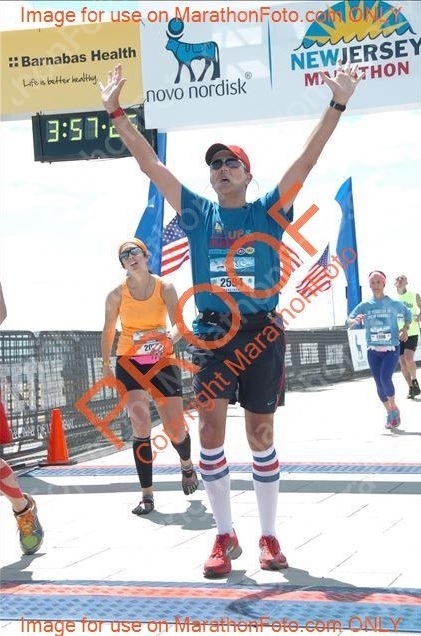 It was interesting for me that my reaction to achieving my PR at the New Jersey Marathon was a very brief high, but it soon faded. Why? I don’t know. I had prepared for this for over a year (longer if you count the training leading up to the 2013 Marathon). Personally I look back on the race and think I can do better. Yes, I did achieve my goal but it wasn’t pretty in the second half. I was nowhere near a negative split and I didn’t pace myself well in the second half. Am I being too hard on myself? Maybe, but perhaps it’s a reflection on my new focus and desire to do a bit better and achieve greater goals. This is what spurred me into registering for the ‘Chasing the Unicorn‘ Marathon taking place August 17 this year. Why is it called ‘Chasing the Unicorn’? What is it all about? Why am I running it? The logo of the Boston Marathon is the Unicorn. The primary objective of this particular race is for runners looking to earn a BQ (Boston qualifying standard) ahead of the registration deadline in September. In order to run the Boston Marathon, runners need to achieve a certain qualifying time goal in relation to their age group. For male runners in my age category (40-44) the qualifying standard is a marathon time of ‘3 hrs 15 min 00 sec’. This race was first put on last year as a response to the increased demand to qualify for Boston in the wake of the 2013 bombings. Here is an article from Runner’s World Magazine that was published about the inaugural event in 2013. 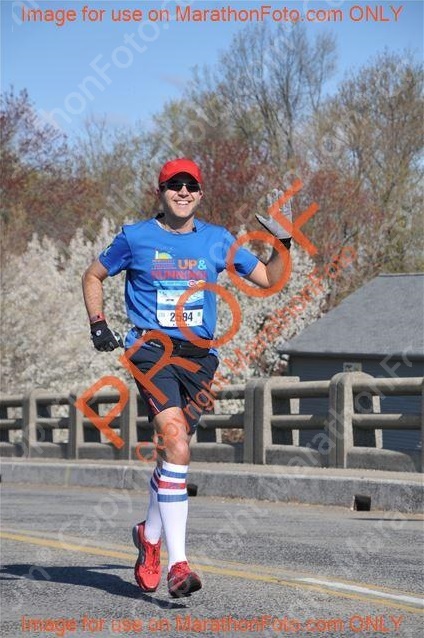 As you may have read from my New Jersey race recap my marathon PR is 3 hrs 54 min 30 sec, not even close to the qualifying time unless I was in the 60-64 age category. So why is it that I have chosen to participate in this race and why was I allowed as I appear to be well outside the qualifying time? I was already familiar with the ‘runBucks‘ series of races and the race director Pat McCloskey having participated in a few of his races in the past. My wife has won a couple of awards running in his events and is all too pleased to show me her awards (sore point in our household) 😉 I hadn’t considered running a race like this last year as I didn’t feel there was any way I would be reaching the BQ standards any time soon but two things made me reconsider. Firstly, I do some of my training runs on the canal and I have probably covered most if not all of this course during my long runs and secondly I think I can better my PR. 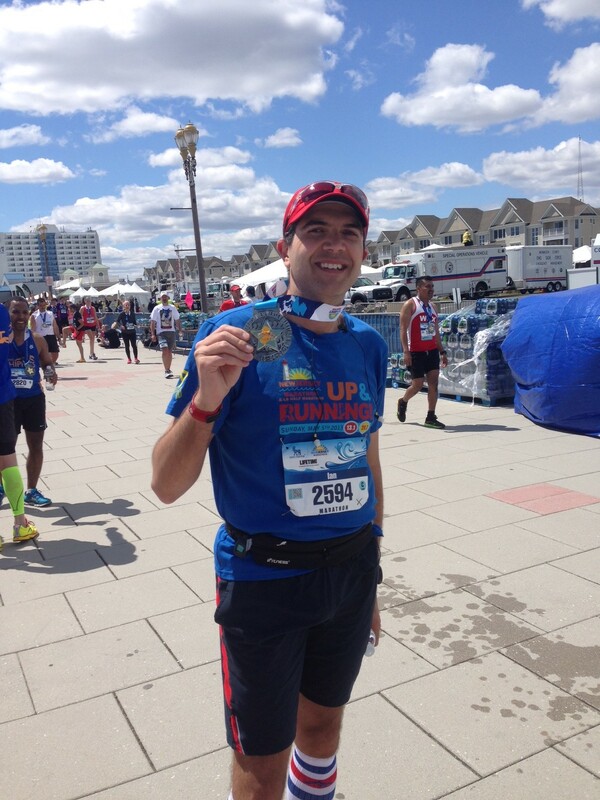 I had struggled a little after the New Jersey Marathon back in 2013 and was a little demoralized having trained and not earned my PR but throughout the rest of 2013 I just set out to enjoy myself, run races with my wife and took my races with a relaxed attitude. I did attempt a PR in the Benjamin Franklin Bridge 10K which I did achieve but mostly it was about maintaining my fitness going into the inaugural Dopey Challenge back in January of this year. If you look at my recap of those four days down at Walt Disney World you will see how relaxed I was and how I found the marathon such an enjoyable experience (even after the previous three days of running) compared to my previous two years running that event. 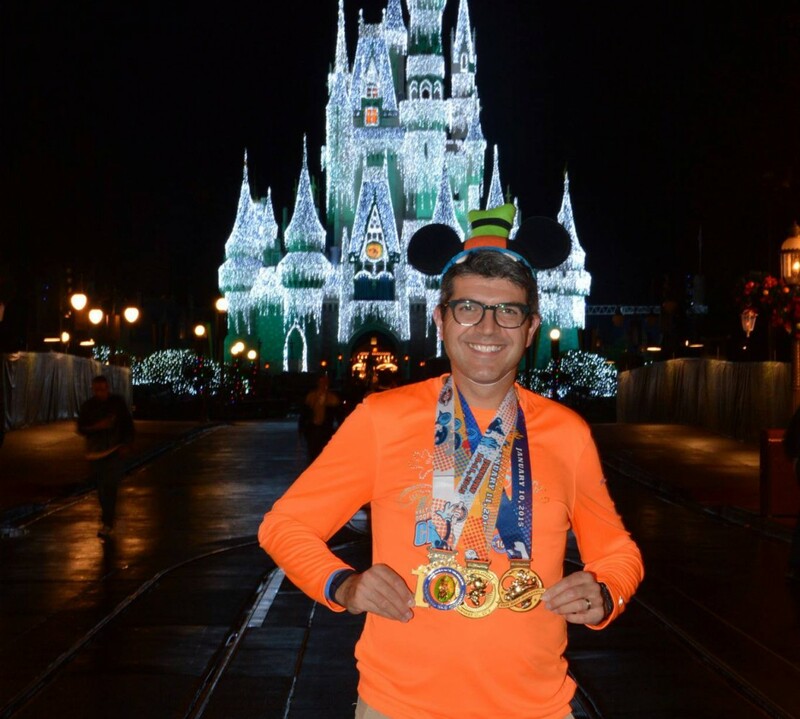 I came back from Walt Disney World with a new confidence in my running and throughout all the training for New Jersey I felt comfortable and watched my speed become more consistent and a little quicker. 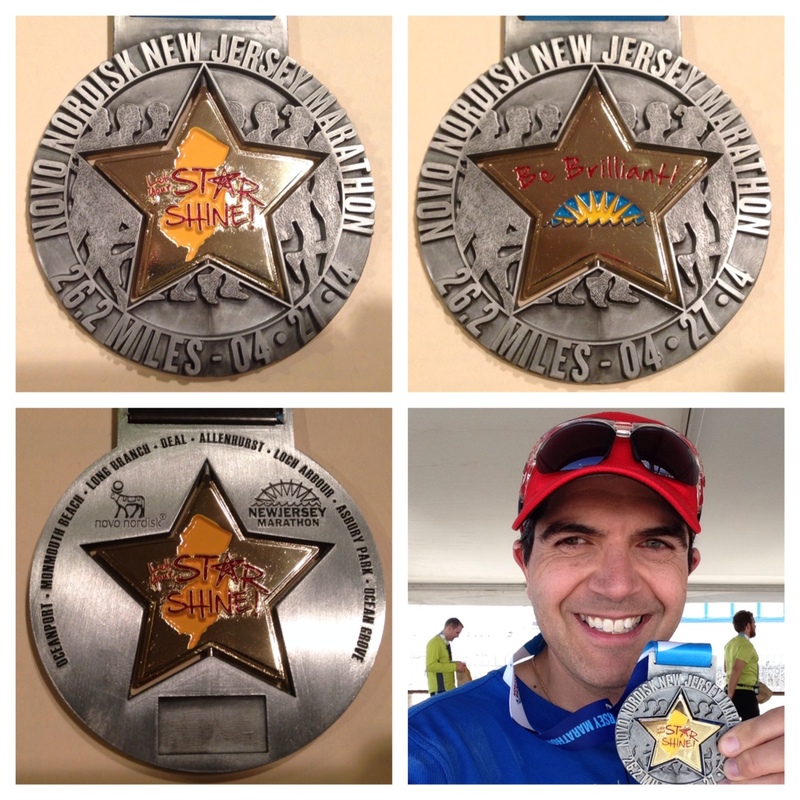 In fact I ran three races in the four weeks leading up to the New Jersey Marathon at or close to my marathon goal pace. 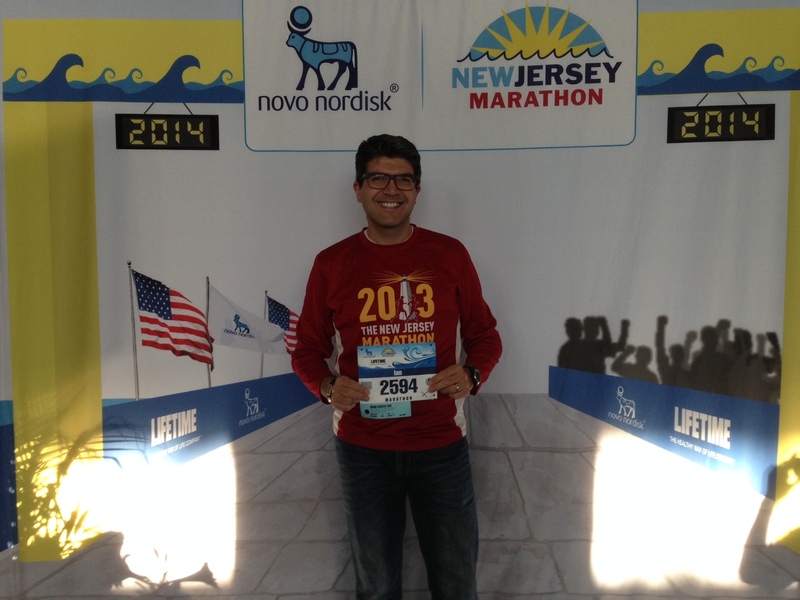 I felt confident going into the New Jersey Marathon and did in fact achieve my goal. Okay, so not a BQ by any means but I do feel like I can do better. This prompted me to reach out to Pat directly and ask him if it was okay to register. I told him upfront that I wasn’t anywhere close to a BQ but I feel that this was the type of event that I could aim to improve my PR. It wasn’t going to be crowded (a very limited field) and I would be running solo so it seemed like a good opportunity to try. I also asked Pat if it was okay based upon the field size if it was okay to enter. I didn’t want to take away a BQ opportunity from a runner who was genuinely in a position to earn a qualifying time. Again, Pat reassured me that this would not be a problem just to keep my awareness up that I was going to be lapped…a lot (this is a double out and back loop of about 6.5 miles). So here I am. Back at it in marathon training mode. In the past (marathons 2 through 8) I have used Hal Higdon’s Intermediate 1 training plan with Jeff Galloway’s run/walk method. This time I am ‘upping’ to Hal’s Intermediate 2 plan. It calls for a little increase in mileage (I get a third 20 mile training run) and with the summer here I can get up a little earlier and make time to do some speed workouts without fear of slipping on ice!! I know it will be warmer than I am used to training for a marathon but hopefully I will acclimatize enough over the summer to make this work. Here is my training plan for this event, the Baltimore Marathon and through the Goofy Challenge next January. It’s going to be tough especially with the increased mileage but my goal is to be sub 3:50. Yup, I’ve put this down here in writing. I’ve just taken the longest break from running since I started back in August of 2010. I usually run (train) 5 (sometimes 6) days a week. I have a full race calendar planned and I never like to finish a race without my next one scheduled. I’m the guy that when you ask what I am doing a few months from now I check my training calendar first. This post is going to be a little long, a little graphic (descriptive not visual) but it does have a happy ending (thankfully). My work medical insurance plan covers an annual physical. Since I started my journey to fitness I have been very steadily recording my activities, managing my weight and trying hard to maintain a healthy lifestyle. 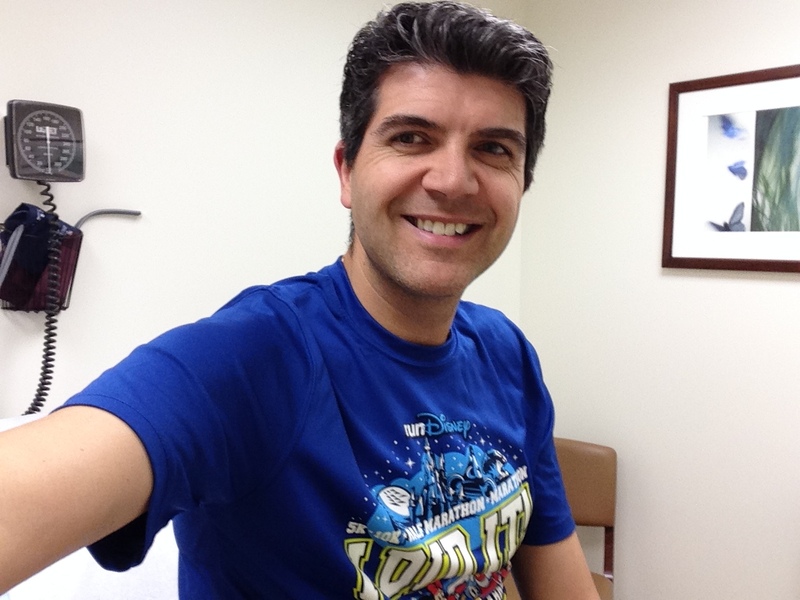 A little bit of family history also has led me to making sure I take the opportunity to schedule these annual physical exams which I do every year now around my birthday. This year I made my usual plans, blood work just before my birthday and the exam a week later after my birthday. That way I can have year on year comparisons on my health. I should point out that I have (thankfully) a doctor who is alert and maybe a little conservative. Based upon some family history he has started some preventative screening of the prostate at 40 rather than 50 as is recommended. So the day arrives of my physical exam. My resting heart rate thanks to all my changes in lifestyle is 42 beats per minute. All the blood work looks good, the Prostate-Specific Antigen (PSA) test is low (0.5ng/ml). Finally we get to the ‘physical exam’. The doctor puts on his rubber glove, looks and me and says ‘Drop ’em”. Okay guys, it’s not as bad as you think. 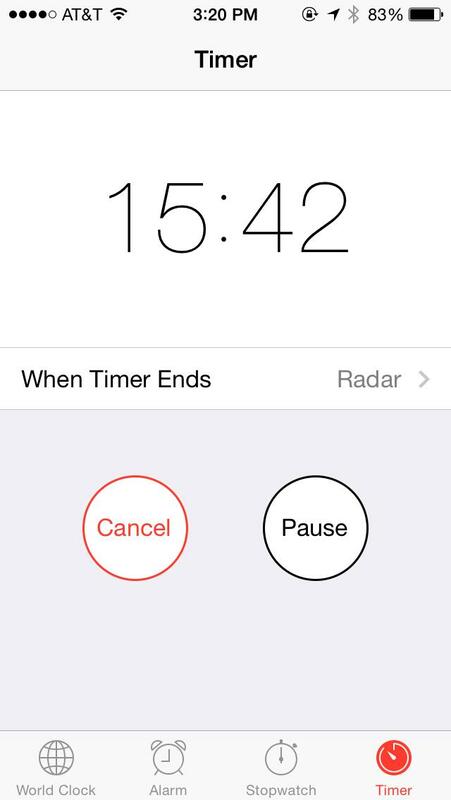 It is usually over in a few seconds. Well….usually it is. I wasn’t sure why it was taking so long. 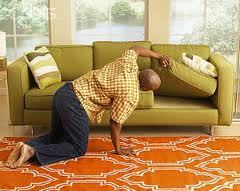 I almost asked if he’d lost his keys or something!!! Now where did I leave those keys? As I was getting myself back to normal states of dress he tells me that he feels some type of abnormality and wants me to see someone to get it checked out further. Okay, no problem. Better safe than sorry. He refers me to a local urology practice at the hospital and I make my appointment which is set for the following month. I left the physical exam a little concerned but I tried to not think too much about it. I couldn’t do much at that point as this was a preliminary exam and I hadn’t seen a specialist to confirm anything yet. On the day of the appointment I head over to the hospital with all the paperwork complete and sit in the waiting room for what seemed a very long time. 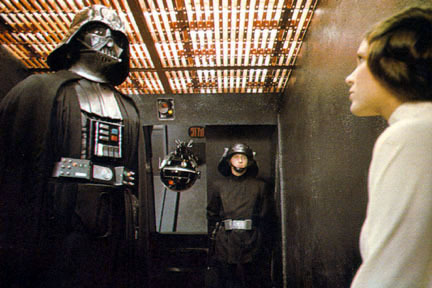 When it’s my turn I meet up with the nurse who goes through all my paperwork and preps me for the doctor. Finally I get to meet the doctor. 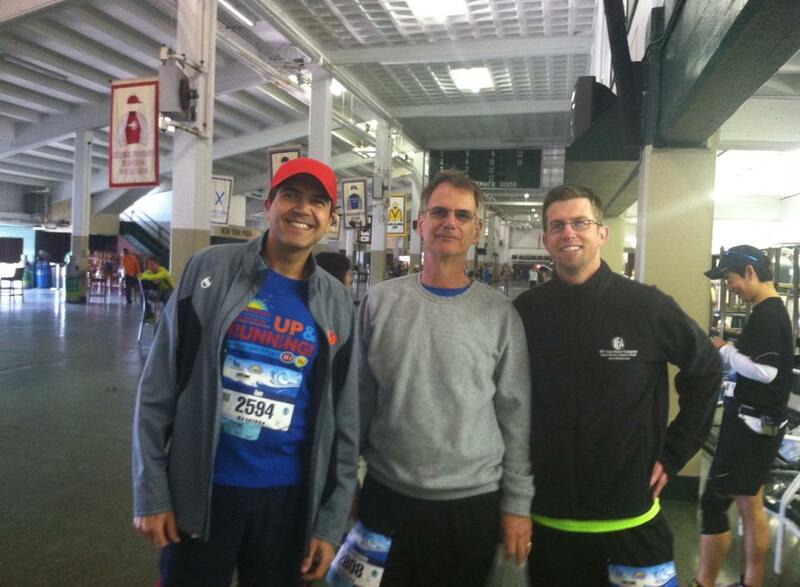 That day I was wearing my Philadelphia Marathon shirt and he mentioned he had run the race one year too. Cool. I think I’m going to like this guy. Anyway, on with the exam. So mentally I’m prepared for the exam knowing that it might be a little longer than usual. I assume the ‘position’ and wait for it to finish….but whoa!!! The picture below doesn’t quite capture my expression but I thought at some point he was going to hand me a banjo and ask me to sing the ‘Rainbow Connection’!!! Here is the scene playing out in my head as this is happening. So the doctor also detects an abnormality, tells me he agrees with my family doctor’s concerns and decides he wants to send me for some further testing. 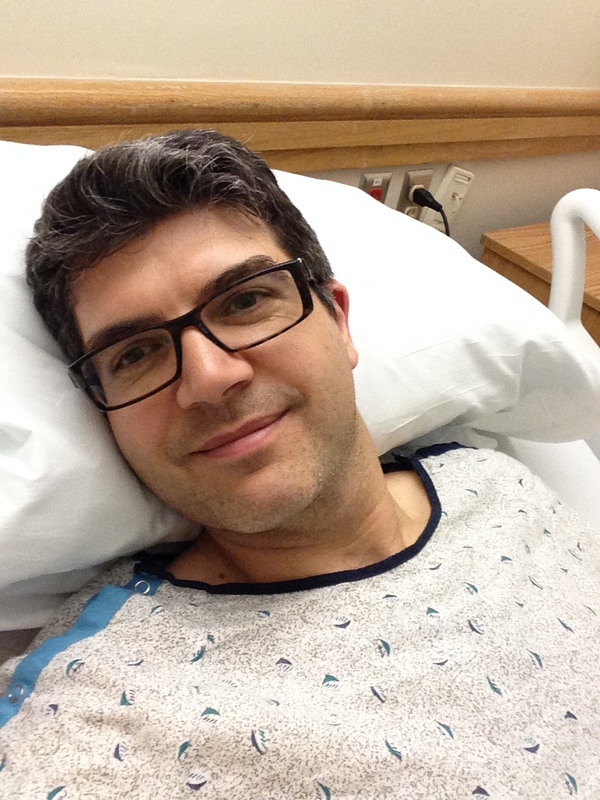 He tells me that my options are an ultrasound, and MRI and ultimately a biopsy. I wasn’t really prepared to hear that final option but at this stage the doctor had the upper hand (ooooh…that’s a bad reference). Based upon my age he wants to do the test sooner than later and recommends I get the MRI which might provide more info. Okay, now I start to feel a little more concerned. I left the appointment with the doctor’s office telling me they will call with the details to make appointment for the MRI. A few days pass and I follow-up with the doctor’s office about the appointment. Nothing yet. So I wait a few more days and still nothing. I’m eager to get this test done and behind me so I follow-up another time and this is when I find out that the insurance company had other ideas saying that at my age the MRI wasn’t necessary so after about a month of back and forth between the doctor and the insurance company the doctor says that we should just go straight to the biopsy and tells me my options. 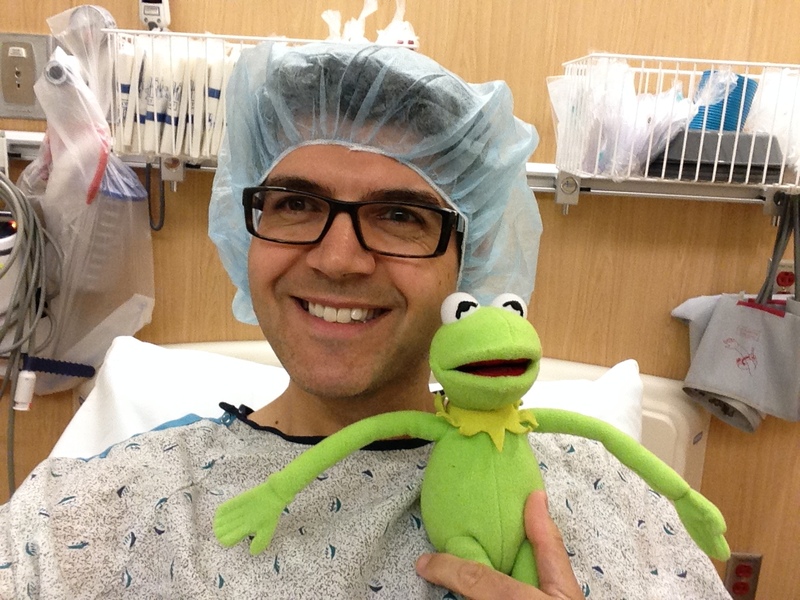 The biopsy procedure requires the doctor to insert a needle into various places in the prostate 12 times and take a sample of tissue each of those times. 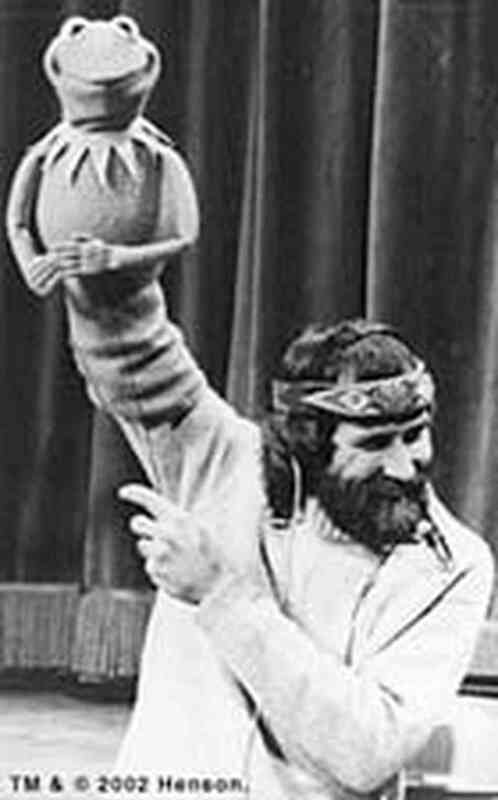 The needle would be inserted ‘Jim Henson’ style. I had the option to do this in his office which will take about 10-20 minutes while I was awake or do this under anesthesia in the hospital. Guess which one I chose! You’re going to do what to me??? 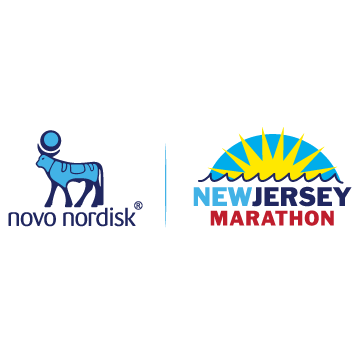 With the New Jersey Marathon a couple of weeks away (April 27th) I asked him if we could wait until I had run the race and I would take his first available appointment the following week. He was fine with that, actually he recommended that, so the date was set for April 30th. 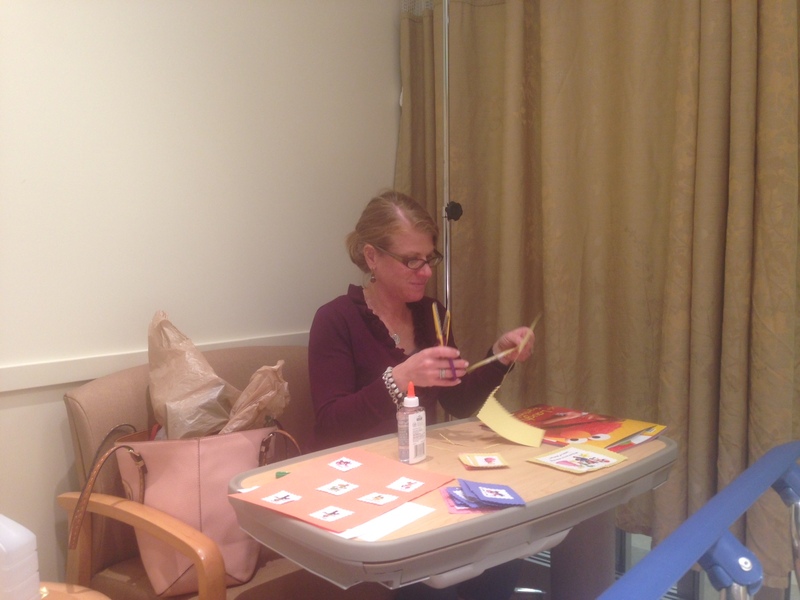 The week before the biopsy was scheduled I had to do some pre-admission testing. Simple blood work and checking medical history, height and weight. They also provided me with pre-admission instructions which generally include no food after midnight before the procedure (not a major issue) and no anti-inflammatories or other meds or supplements that could thin the blood for up to a week prior to the procedure. 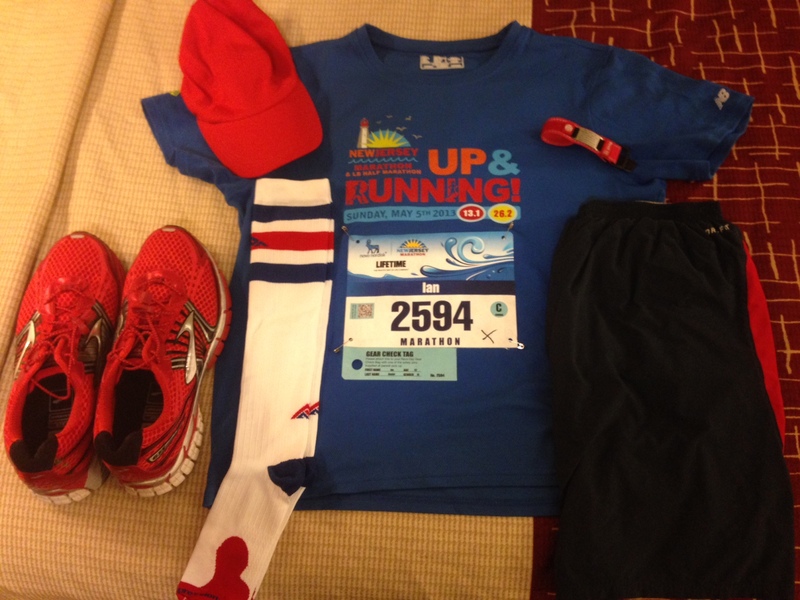 Hmmm…didn’t I say something about a marathon? As I mentioned in my previous post (the New Jersey Marathon race recap) after the race because I was unable to take any anti-inflammatories I relied on an ice bath to reduce post run inflammation and a couple of days later (the day before the procedure) a took a brief 3 mile run to keep loose. I was able to keep loose but I was still just a little sore. So the day of the procedure arrives. I spend the time waiting for my ride to the hospital pacing around the house. I hadn’t had my usual morning coffee and I was feeling antsy. I had to be at the hospital at 10:15am and I was dropped off a little early and was sent pretty much straight away into pre-op. I got myself my fancy ID band from the nurses and was provided with the always awesome backless gown. The last time I had one of these plastic wrist bands I was at Disney and got a few medals. Not this time. So having got changed into my stylish surgical outfit I brought out the decoy…yes, I figured I could provide the doctor with a substitute so I didn’t have to have the needles. Neh…didn’t work. So I sat in my gown from about 10:30am until about 12:30pm with occasional visits from the nurses, the anesthetist, the surgical RN and the doctor. Funny that when they all came in to take my vitals they looked at the charts and said “Oh, you’re a runner” as they noticed the low heart rate. I was feeling proud each time they said it. 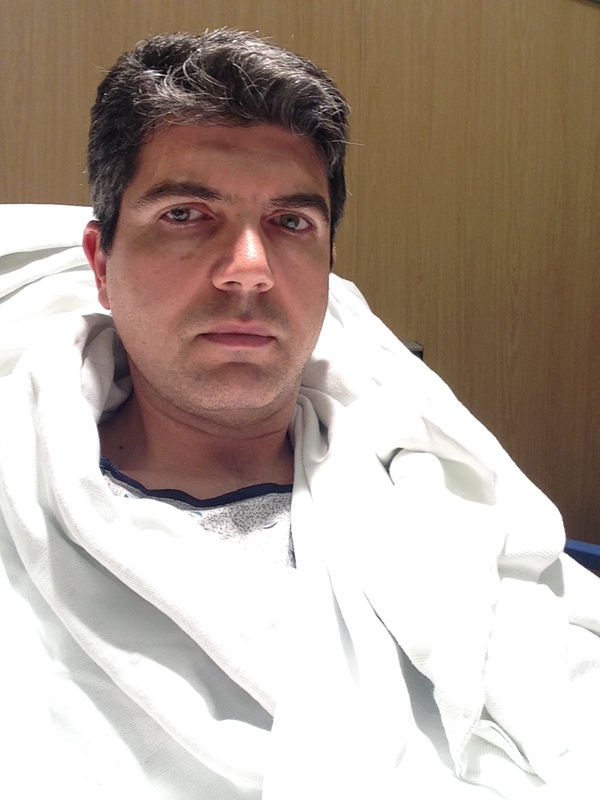 The anesthetist told me essentially he was going to put me unconscious. I was okay with that. The doctor also came in and repeated what the procedure was going to be. He checked that all the pre-op checks were done and that I had my IV with fluids, the antibiotic ready in the IV to be administered during the procedure and that I was ready to go. The surgical RN came in to get take me to the operating room and administered a pre-anaesthetic sedative (basically a ‘Valium’ injected into my IV line. Having got my buzz on I let the nurse take me in for the procedure. As I entered I was already a little woozy, I heard someone say the word ‘propofol’ (think Michael Jackson) and then nothing else. The next thing I know they are waking me in the recovery area. I was told by the doctor that there would be no pain as the procedure was localized to the point and duration of the needles being inserted but there may be some bleeding in my ‘fluids’ for up to a week later. Fine. I think I can handle that and at least I knew what to expect. I was still lying down for the most part until they took me back to the post recovery area. The nurse there made sure I was able to sit up and offered me some food and drink and called my father in law to come and pick me up. All good. When I felt okay I told them that I thought I was ready to go. They came and removed the IV from my arm and left me to get dressed. It was at this time that I stood up from the bed and asked where the bathroom was. I walked across the hall to do my stuff (I had been pumped full of fluids through my IV) as I felt the need to go. So, like a guy, I’m standing there and….nothing. What? I totally need to go but nothing happened. Eek. Next thing I know I’m seeing drops of blood but nothing else. I call the nurse who takes me back to my room and tells me she will call the doctor. I’m just a teeny but worried now. I tell her that the doctor said there may be a little bleeding and so I thought I would try again so she took my back to the bathroom. I’m hoping this was just a post op effect and I would get over it and be able to go home shortly, after all I was in the middle of being discharged at this stage. So I’m back in the bathroom standing there and praying to go. 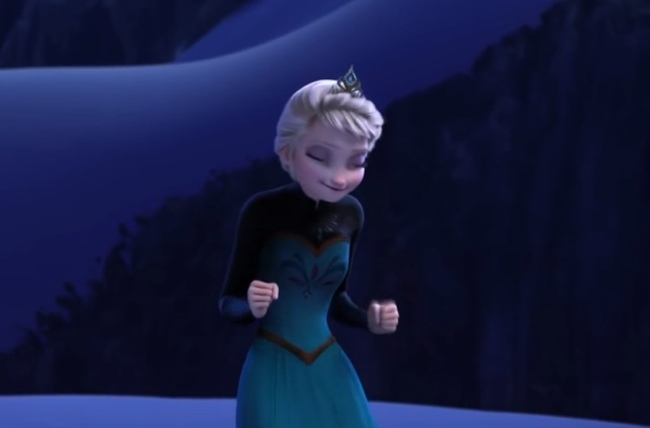 I dug deep and tried very hard to ‘Let It Go’! Nothing but a few more drops of blood. I went back to the nurse and she told me to lie down and called the doctor again. The nurses station was right next to the room I was in and I heard for the first time ever a word used in the same sentence as my name. Something I hoped I’d never really have to hear. That word was ‘Catheter’ and the doctor had just suggested I have one!!! The nurse looking after me asked a male nurse to set this up for me as she felt I would be more comfortable with a male nurse. 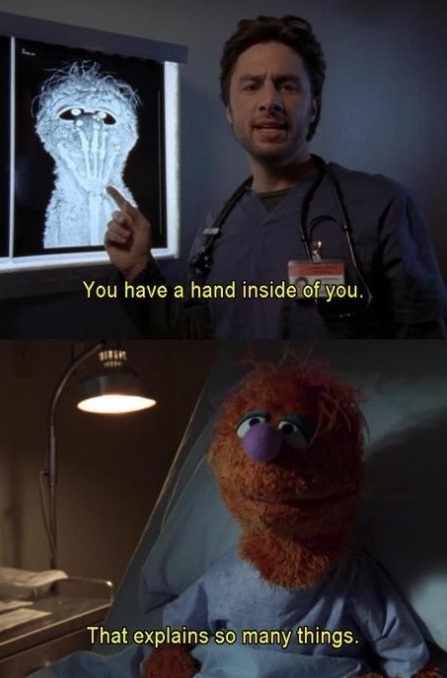 At that point I wasn’t comfortable with any nurse doing it quite frankly. Not knowing what to expect but knowing where to expect it I was quite a bit more than just anxious. The male nurse came in with the kit and all the related paraphanalia. He said he does this all the time and hasn’t had any complaints. I didn’t find out until after he was done that he was an OR nurse and that, yes, he does this all the time but the patients are all asleep when he does it so that’s probably why he hasn’t had any complaints. I will say though that he moved so darned quick I didn’t even have chance to catch my breath and before you new it I was…well, um…connected!?! 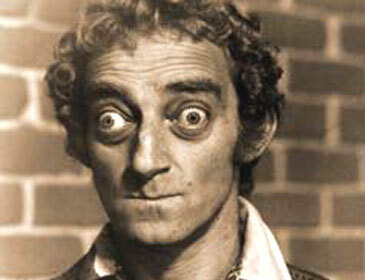 This is probably what I looked like right about now. I wouldn’t put it past the little guy to try!! The doctor left and my father in law came back into the room to sit with me. It was around this time that I started shaking. I got really cold and could not stop shivering. 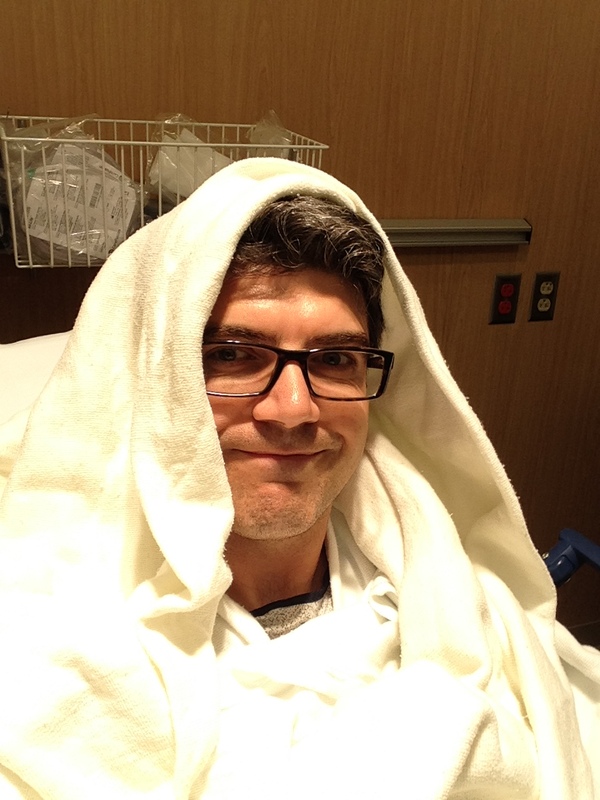 The nurse came in and put an extra blanket on me but that didn’t seem to stop the shivering. Next thing she came and put some heated blankets around me, wrapping my head and shoulders and turned on the heat lamp above the bed. We were not sure if it was due to all the fluid and the ice water I was drinking. She took my temperature and it seemed I had spiked and my temperature was now over 100 degrees. She called the doctor back and we waited for him to come by. She provided me with a cup of coffee which I was shaking so much my father in law feared I would spill it. Not good. The doctor came back and checked me over again. 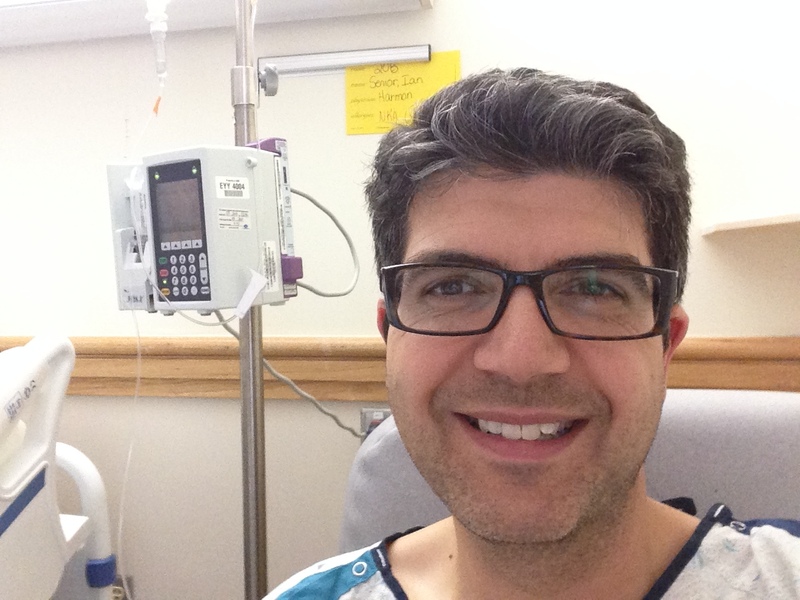 He decided that the fever was a result of me being in that special 3% of complications and I had picked up some form of infection during the procedure. He wasn’t happy with the ‘wine’ I was still producing and subsequently had the nurse give me a new IV line and presribed more fluids and a dose of antibiotics. Additionally I had some blood cultures taken for the lab to check. My arm felt like a human pin cushion at this stage. The doctor determined I should be admitted overnight for observation. Secretly I was more than relieved that I was going to not have to go home with the catheter that night, but for good measure, he put some ‘traction’ on the catheter and said he would check on my later. Guys, if you weren’t squeemish before, traction entails pulling the tube taught and taping it down so there is tension. My eyes are watering again just writing that last sentence. So there I am. Not going home. I had planned this grand day of going home and watching DVD movies with my feet up. Now I am admitted into the hospital with a fever and my own personal water feature. 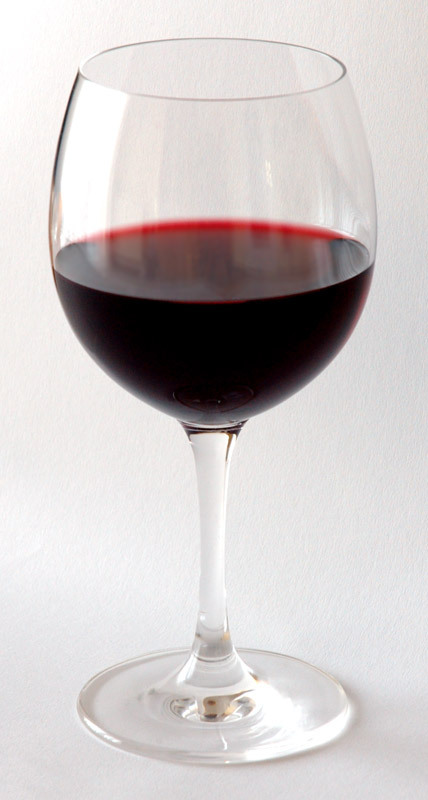 When life gives you lemons…make red wine!!! My wife had called my father in law while the doctor was in the room and so she had a chance to speak to him in case she didn’t see him later. Between my wife and father in law, arrangements were made to pick up the boys from school and stay with them at home so that my wife could visit. I’d taken a couple of tylenol by the time my wife had arrived so the fever had broken but I didn’t feel particularly well when she came it. I was pleased to see her but wasn’t exactly comfortable with my tube in traction. Once she arrived my father in law bid me well and left for the night. We sat waiting until there was a room available. It was a looooong wait. I think the call to admit me was around 4pm. I didn’t move out of that room for almost 4 hours. Luckily my wife brought her own entertainment (in the form of arts and crafts for our son’s 4th birthday party) while I sat uncomfortable and bored. I hadn’t moved in hours and my wife pointed out that my feet were hanging off the end of the bed as I was too big. At long last a room opened up and by 9pm that night I was wheeled across a very bumpy route (traction or no traction the bumps didn’t help) and finally made it to my room. Finally I was in a bed where I could support my feet and I veeeeeery slooooowly moved across onto the bed so as not to jiggle my tubing. My wife bid me good night and the nurses on the floor started the whole admittence procedures which pretty much involved taking my vitals every 30 minutes through 4am!! Not that I got much sleep that night. I was over tired, I was a little sore, I was too terrified too move with stuff hanging out of the sensitive bits and I was a little concerned about the biopsy results (yeah…rememeber that?) I was also pretty freaked out that there was still the possibility of me going home like this with my two boys (the Heir and the Spare) lying in wait to see me. Additionally I was being pumped full of fluids so much that I pretty much felt like Niagara Falls. It certainly felt like this to me. As the night progressed I listened to (and caught up on) podcasts that I had stored on my phone. The nurses came in every 30 minutes to check my vitals and to empty my ‘wine bag’. 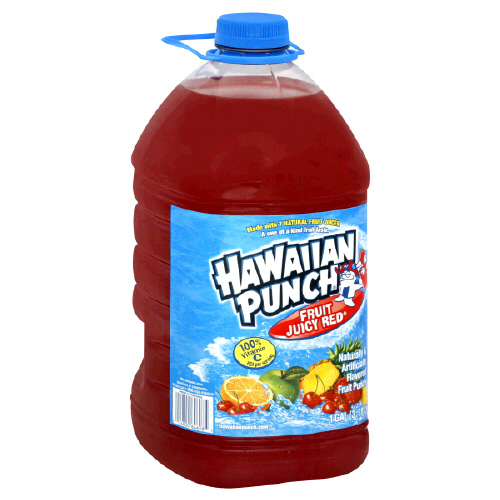 We had now moved from a deep claret to fruit punch (in volume). This same cycle happened over the next few hours and I was pretty much awake most of it. At one point the lack of movement, the fact that my feet had been somewhat unsupported most of the day and probably the after effects of the marathon finally caught up with me and at around 2:30am I started cramping up in my legs really bad. I called the nurses who wrapped my legs in compression sleeves that alternatively inflated and squeezed my lower legs for while I was lying there. Nice. I wanted a pair of these at home for after my long runs. The next thing I know it is around 6:45am and I open my eyes to see the doctor visiting and inspecting my ‘tube’ for signs of progress. 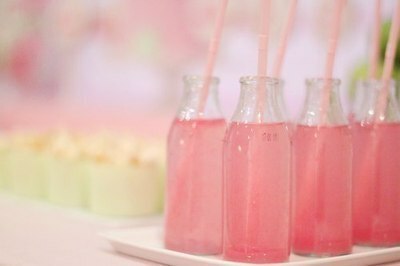 Overnight I had flushed Lake Erie through my system and I was starting to look ‘pink lemonadish’. This was a good sign. My vitals had also stabilized although my pulse was still a little high. The doctor told me he would check back on me around noon. I confessed I was concerned about going home with the catheter around my sons and he said if all goes well I would have it removed before I left and they would keep me in under observation until that time arrived. Phew. I immediately felt a little more relieved (although I should not use the word ‘relieved’ considering everything else that was still going on). I settled in for a long morning which actually passed by pretty quick. The doctor’s assistant came over at noon to check on me and was very pleased with my progress that morning. She whipped out her iPhone to take a picture for the doctor (I know what your thinking but the picture was of the fluid…not the connector) and got a text message back that it was okay to ‘disconnect’ me. Woohoo!!!! I wasn’t jumping for joy physically but mentally I did a triple backflip with a double twist and stuck the landing. They sent in a male (student) nurse to do the honors. He said he would uninflate the catheter and then a quick pull. If there was any tension when he pulled he would stop. I closed my eyes and he told me to take a deep breath. Before I knew it (actually I knew it) it was out. Phew. Finally I was able to sit up and move my body a little. Once they get me unhooked from the compression sleeves the nurse helped me sit up and get out of the bed finally. For someone who leads an active lifestyle not moving for more than 24 hours is tough. I got out of bed and sat in the chair just as they brought in lunch. I was still hooked up to the IV and receiving the antibiotics and fluids but was much more comfortable. Finally out of bed. Totally bloated by fluids but happy. The goal was to have me ‘go’ naturally until they knew I was able to go consistently. So in addition to the IV fluids I was drinking mass quantities of water. Around 3pm the doctor’s assistant came back and checked me over. I was pleased to show her my current state which was as good as it gets. With that I was told I could get dressed and they were going to discharge me and send me home with a prescription of antibiotics and instructions to continue drinking for the next few days and return to visit with the doctor the following Friday. I got home and immediately started drinking. I didn’t want to have to go back any time soon. All I can say is that I drank so much that night that I was up every hour and each time before I got back into bed I drank another bottle of water. When I weighed myself the next morning, figuring I’d hardly eaten in the last couple of days I had probably lost a pound or two, I was surprized to find I had gained 6lbs…all fluid!! The next day I took it easy and logged into work from home. Drinking constantly. I must have been taking in more than 4 liters of fluid (that’s about 8 bottles of water…a little more than the average 8 glasses a day). Later that morning the doctor called and told me that he had been contacted by the ‘Infectious Diseases’ department….did he say ‘Infectious Diseases’? Apparently I had picked up another infection and so he prescribed another set of antibiotics for me. 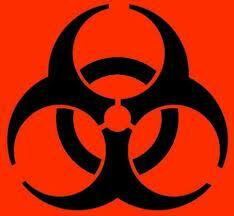 This set of meds came with a warning label that was pretty much a bio-hazard warning on the safety label. Eek!! Are you sure I’m supposed to take these? What made me laugh was that the instructions said to take with lots of water LOLOLOLOL!!! That afternoon I went to pick up both my boys from school. As I was about to leave the parking lot the doctor called. We hadn’t expected any pathology reports until the following week but he wanted to call me as soon as he had received them. It was good news. All the tissue samples came back NEGATIVE. I was very very relieved. All this other stuff seemed unimportant at that moment. I thanked the doctor and immediately called my wife with the good news and them my parents and my in-laws. Everyone was, needless to say, relieved. The doctor did add that there may have been some contamination in one of my blood cultures but he would let me know more on Monday. I went to bed early that night. I was pretty tired after the last couple of days. I did feel a little sore. Kind of like I had sat on a bike for too long. I didn’t think too much of it and fell asleep pretty easily. The next day was opening day at Sesame Place where my wife works. I had to continue my streak of 12 opening days (my eldest son is 7…don’t judge me). I hadn’t planned on doing any rides but just to walk around with the boys. I took in a couple of shows but just didn’t feel right. Finally I reached out to the doctor to see if I could take anything for discomfort. He told me tylenol was fine, take a warm bath to relax my pelvic muscles and he would check in with me later. 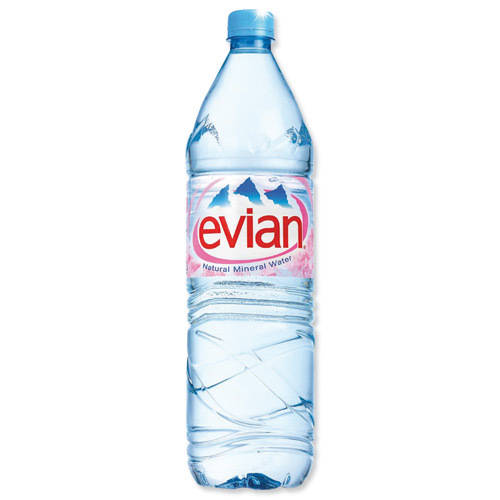 I had a slight recurrence of my ‘pink lemonde’ post warm bath (which is waaaaaaay better than an ice bath by the way) but returned back to my pure ‘Evian’ state with much fluid later. 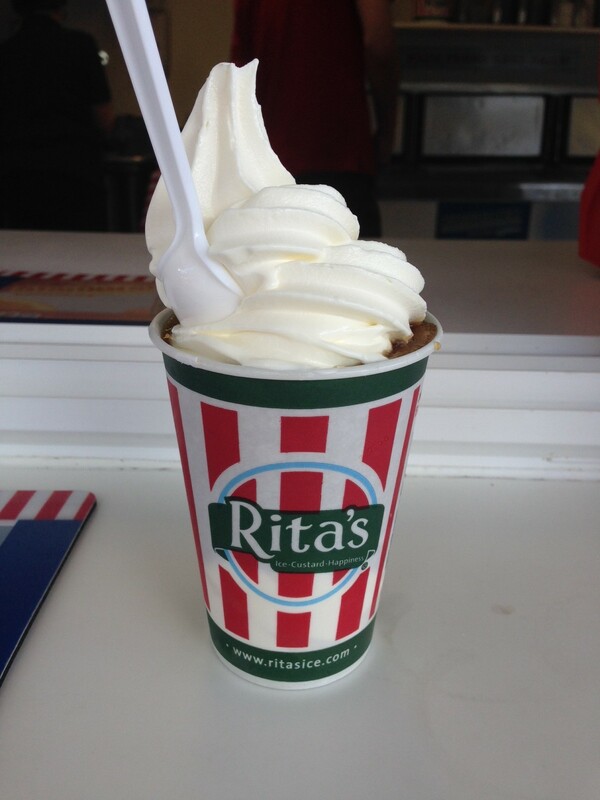 So this week I was really focused on my Fitbit….I had to earn my food calories somehow. It’s amazing what I used to take for granted running all the time. It takes a lot to reach 10,000 steps everyday. I barely made that number some days (which did involve a secret trip up and down from the basement a couple of times to make my goal). I’ve also been much more careful with my daily intake of food. When training I can get pretty ravenous. I had to exert quite a lot of self control this week. I’ve only been (slightly) under my daily calorie allowance twice during the week. My follow up appointment with the doctor was on Friday afternoon. I had been antsy all week without being able to run. I had tried my very hardest to rest but I couldn’t sit still. I ended up taking daily walks around the campus where I work to try and get in at least a mile or two just walking. I was hoping the doctor would clear me to run…I kind of anticipated this and actually went to the appointment in my running gear hoping that he would say yes and I would then drive to the nearby park and get some distance in even if it was just a slow 5K. It felt great to be back. I’m a lucky fellow for sure. I have to thank my family for being very patient with me the whole week and I think we are all relieved that 1) I’m okay and 2) I can get out there and run again and not be such a grump!! I decided to run this race again this year for a couple of reasons. 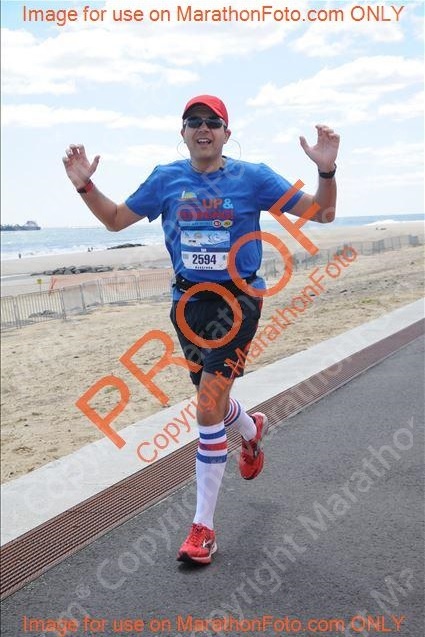 First, I wanted to see the course over it’s mostly original restored course a year after Hurricane Sandy and second, to earn the PR I had set myself as a goal last year before the wheels fell off. So having re-registered in December I set about training for this event straight after completing the inaugural 2014 Walt Disney World ‘Dopey Challenge’. Actually I was already a couple of weeks into the training program when I got back from Florida and so with 16 weeks to go I set about training for New Jersey. In case you hadn’t noticed, this was a pretty harsh winter and I did most of my training (including long runs) on the treadmill. Thankfully I was able to run outdoors by the time the 20 milers rolled around. Coming into this event I had run three good races all below my marathon goal pace (9:00/per mile) and was feeling confident although a little apprehensive based upon last year. 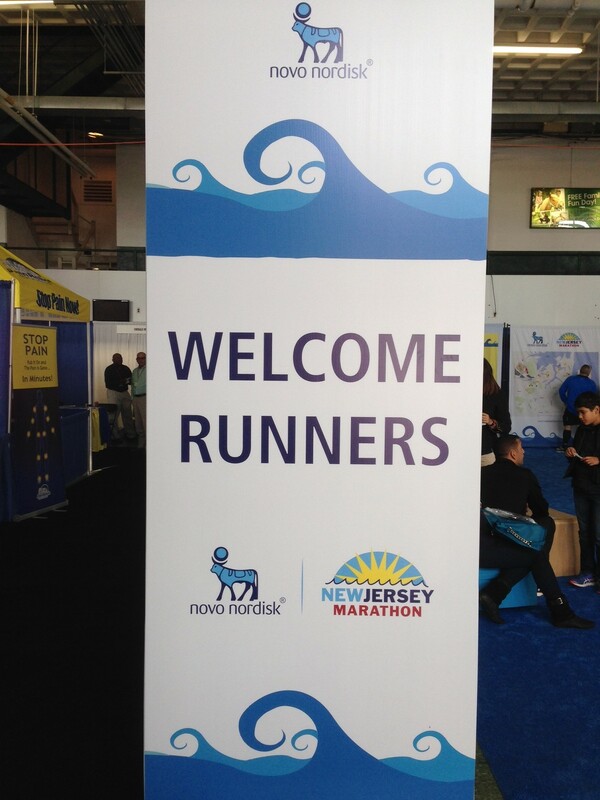 The race director does a great job of keeping everyone informed of events and starting out 10 weeks before the day there were weekly updates on the New Jersey Marathon blog which were very helpful as the day approached. In addition, the organizers were very active on Facebook updating everyone on the activities going on and introducing the marathon pace teams to everyone. Communication was top class. 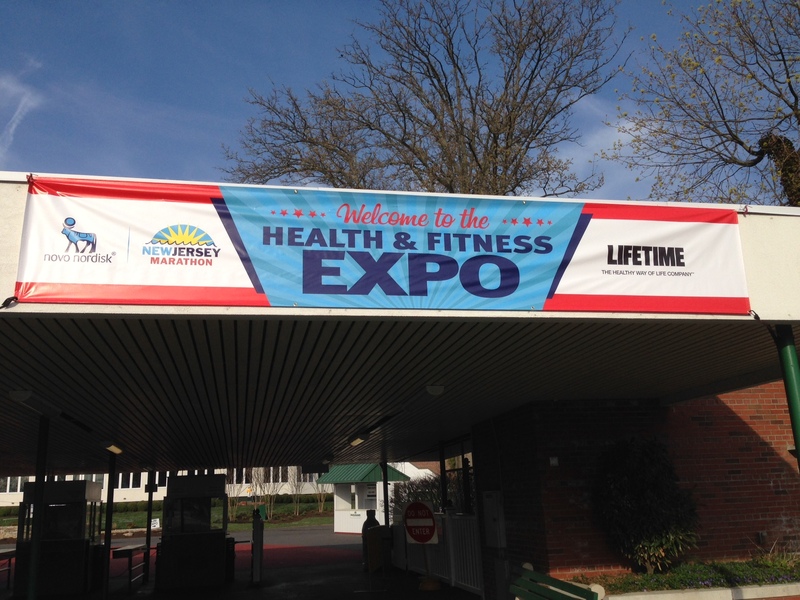 I headed to the expo on the Friday evening before the race as my office is very close by and I didn’t have time to come back the following day (I live about 60 miles from the expo/start line area). 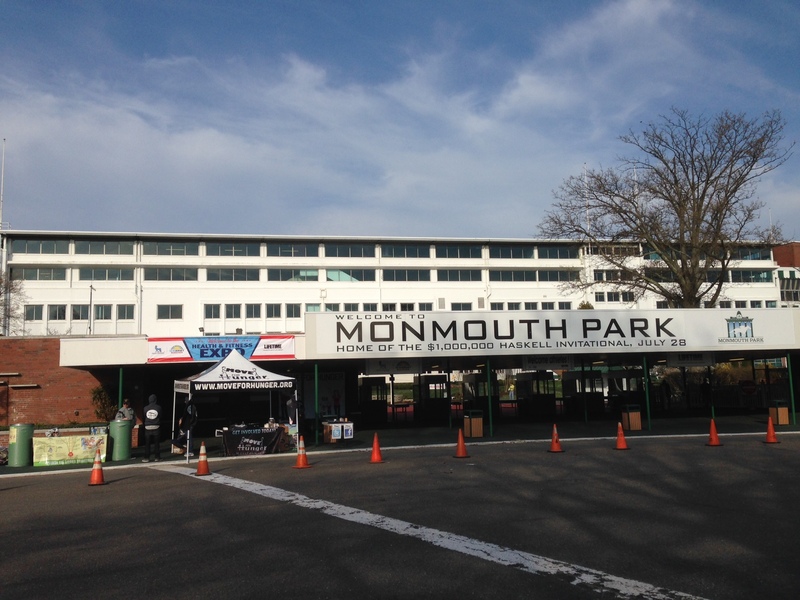 The race expo and the race start and staging area is at Monmouth Park in Oceanport, NJ. The expo is held inside the pavillion. Packet pickup was very simple. I was picking up bibs and shirts also for two friends running the Long Branch Half Marathon (which started and finished along the full marathon course). 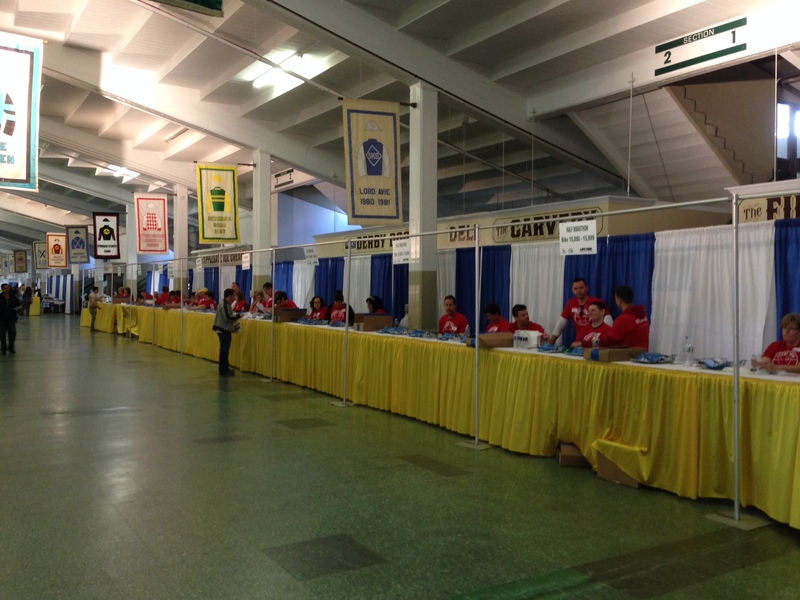 The volunteers were very helpful and there were tables for bib pickup for each race and t-shirt pickup for each race. Shirts were offered in male and female sizes which I see more of these days rather than the unisex shirts that other races offer. There was also a small section of race specific merchandise. I didn’t buy any of the official merchandise this year but there was a broad range of wear and accessories and all the designs were nice too. On Saturday I had planned a full family day so they got a chance to watch me carb load on pancakes although to be fair I bought lunch for them too!!! After a couple of stops and a birthday party I finally said my goodbyes (leaving them at a local carnival) and hopped in my car for the drive to my hotel near the start line. I set up all my gear for the next day and ‘attempted’ to get an early night….yeah, like you can sleep the night before a marathon. There was a fairly significant thunderstorm that evening so I’m glad I made it to my hotel just before the weather turned sour. It definitely cooled temperatures down. When I left the hotel the following morning my car had a layer of frost on the windshield. Great….I was dressed in shorts and a t-shirt. Luckily the weather forecast for the day looked good (if a bit breezy). I set out fairly early for the race as I recalled from last year that the entrance to Monmouth Park is via local access roads. With the Half Marathon setting off at 6:45am (the Full Marathon set off at 8am) I knew that some of the local roads would be shut down for a while so I wanted to get there and parked before the start of the Half. Plenty of other people had the same idea but the traffic wasn’t too bad and I got there around 6.15am. The parking was well organized and they had folks working the parking lots to make sure it was all filled in an orderly manner. My Disney experience showed here as I took a picture of my parking lot location…more of that later. The nice thing about the location is that runners get access to the pavillion early prior to the race. That means you have indoor bathrooms, somewhere to keep warm and a place to sit before having to head out to bag check. I made myself comfortable and relaxed. 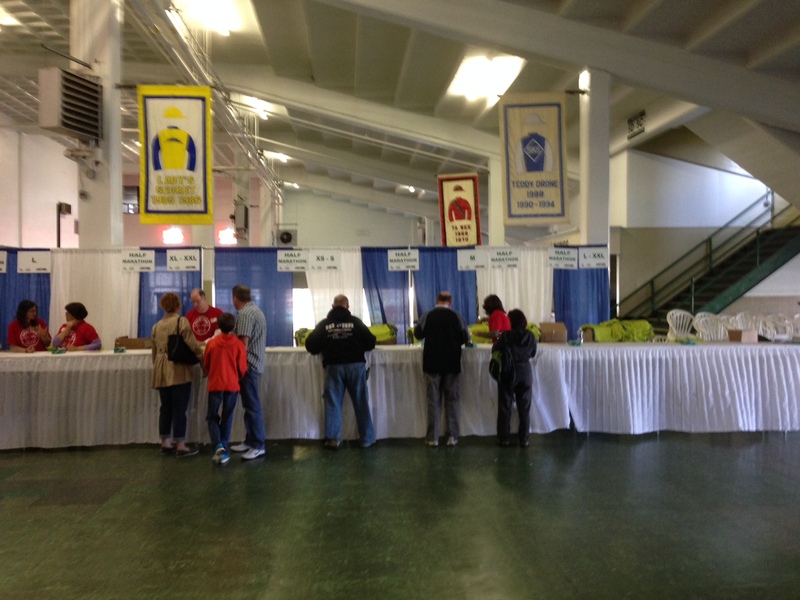 Race morning inside the pavilion. 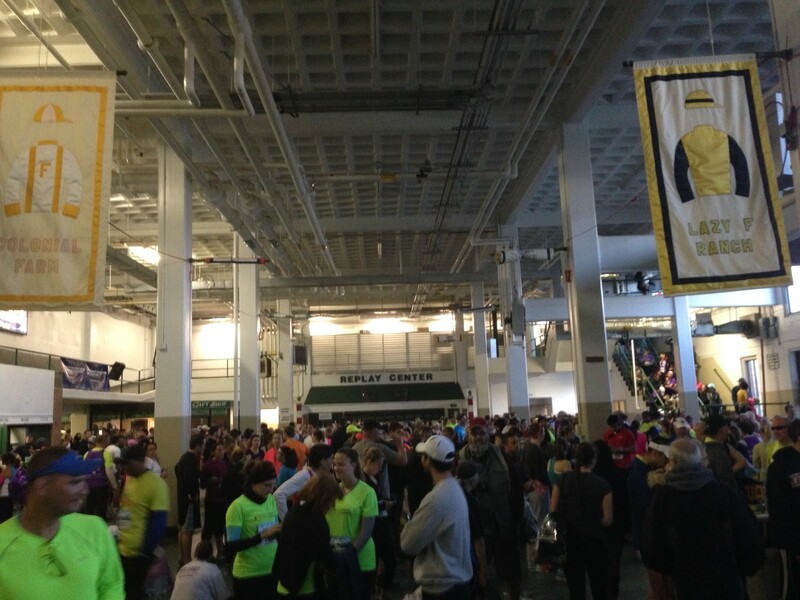 Bustling with Half and Full Marathoners. I didn’t get a chance to catch up with my friends Beth and her brother Larry prior to the Half but I had planned on meeting a couple of other folks prior to the race. While sitting around in the pavillion I also bumped into a former colleague of mine (Marc) and met up with John Thompson from the ‘The Runner of a Certain Age‘ blog and podcast. I had planned to meet up with my wife’s former colleague from her time in London, Chris, but he wasn’t hanging out in the paviilion. I later found out he was staying nearby with family and didn’t plan on arriving too early as he didn’t need to. Around 7:30 we bid each other good luck and headed towards the bag check. Being a point to point race we had to load our gear bags into a waiting truck if we wanted anything like a jacket or other items post race. I packed up my bag, put on my throw away shirt and headed for the corrals. Just after entering the corral I bumped into Chris so I got the photo for my wife which I had been instructed to before the weekend and got ready for the start. I have said this before but I find it relaxing and takes away any nerves chatting with someone in the corral before the start of the race. As we were starting at a race track the start to the race was quite unique…a bugle call. 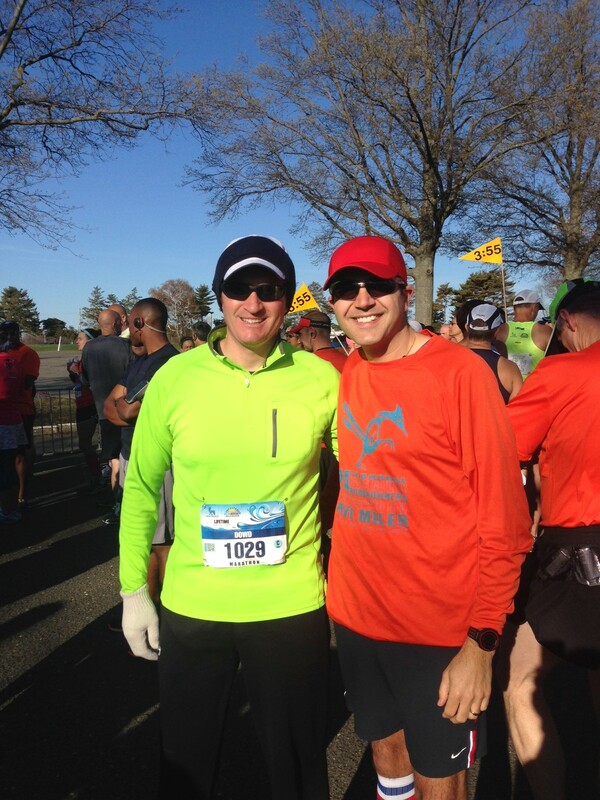 This was followed by a short burst of Bruce Springsteen’s ‘Born To Run’ (hey, this was the New Jersey Marathon after all) and off we went. My goal for this year was the same as last year…you know, the one I blew last year 😦 I had been antsy ever since last year that I wanted to break 3:55 in a marathon and was training hard for this. Still it did give me a little nervousness going in knowing that I was trying to accomplish something I had not managed the year before. I did however feel more relaxed this year. I look back at how good and relaxed I felt running the Marathon on the last day of the Dopey Challenge this past January and how my recent 3 races had gone and felt I could do this. 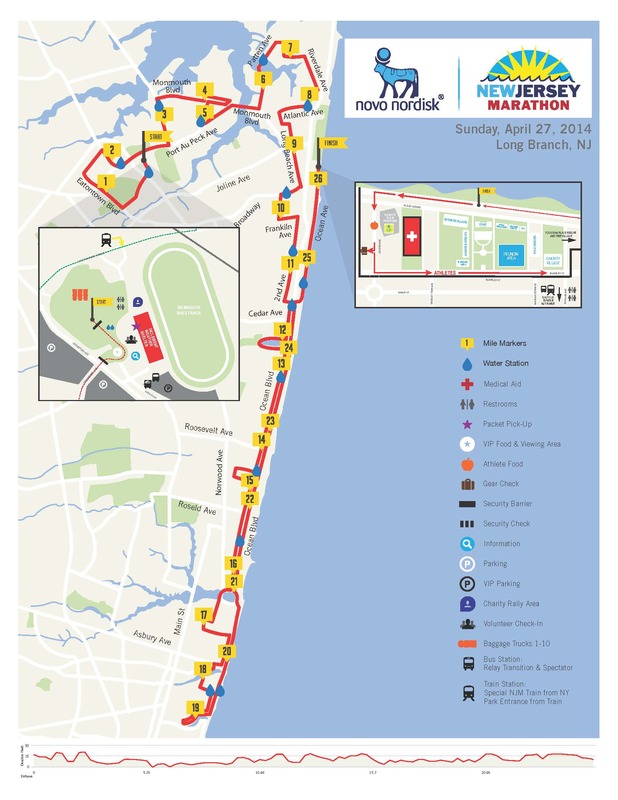 The course at the start has quite a few turns as you go through the local towns then there is a long stretch out to Asbury Park where it gets all twisty again (seriously twisty) then the run back up the long straight and takes you to finish up on the boardwalk in Long Branch (see the map below). Last year I know I went out too fast. I ran almost a PR on the first half of the course and then my heart rate elevated and I couldn’t bring it down. By mile 15 last year I started losing a minute per mile and finished the second half of the race 20 minutes slower than the first half. Not great and was very disappointing. This year I had vowed to be different. Well…I ran a very aggressive first 10K at 8:34/mile pace without really planning on running that fast and then forced myself to back off a little. Still, I made the half way point at almost my half marathon PR 1:53 at 8:39 pace. As we approached the half way point we started running alongside some of the half marathoners and we also passed the marathon relay point. The split for the half marathon and the marathon was around mile 11. 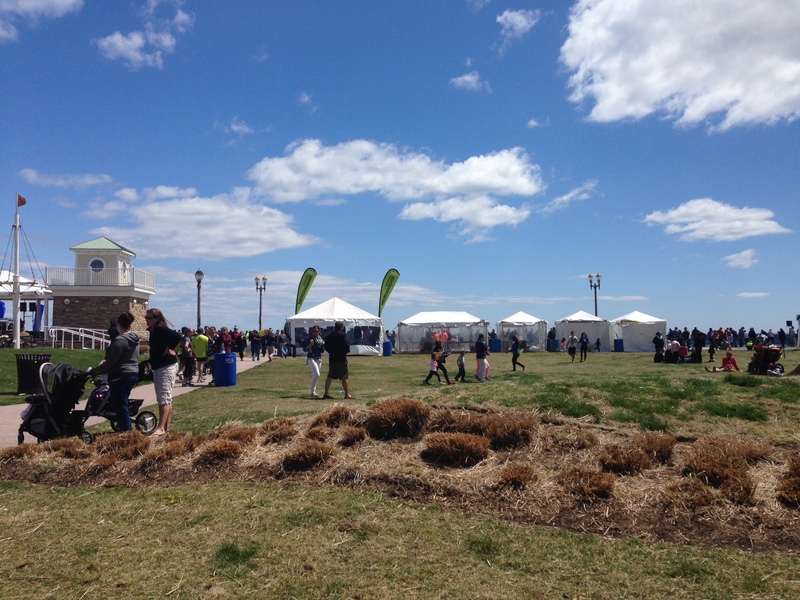 This then took the full marathoners down throught the long straight towards Asbury Park. I was constantly checking my heart rate the whole time during my walk breaks (I was using a 4:00/0:45 interval ratio). I was managing to keep my heart rate stable and was feeling good. The weather was beautiful and sunny on the day and the crowd support around the towns was good. Not so much along the out and back portion as it was run through a very wealthy neighborhood and not many folks came out to cheer but those that did were appreciated. Going down towards the turnaround I felt good and was enjoying the course and the scenery. This was the part of the course that was changed from the previous year and I found it more enjoyable to run (less interrupting turns and a little wider). Once we hit Asbury Park there were lots of corners to turn before we hit the turnaround point around mile 18.5. 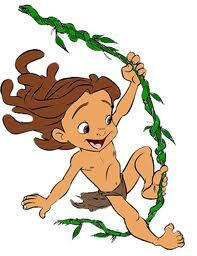 Once we rounded that it was back up from where we had come. You didn’t really notice the wind when we run downwind which we had down through mile 18.5. Once you hit the turnaround you hit the wind. The last 8 miles were effectively run heading into what felt at the time like a wind tunnel. Whew!!! This made the run back up towards Longport just that bit harder. On the return leg in Asbury Park we were able to run a little on the newly reconstructed boardwalk. This was a part of the course that was closed to us last year. Nice to see that the rebuilding of the Shore is ongoing and glad we got to run through part of the restoration. I started to slow a little as the combination of running into the wind and getting into the last few miles of the marathon began to take its toll. After mile 22 I just had to buckle down and stick to my run/walk intervals. I figured if I could focus on just completing the run section without stopping I would make it to the end and maybe…just maybe I might meet my goal time. Plus there was the view of the beach to my right as I was running. What could be too bad. Having inadvertantly hit my lap button while checking my heart rate early in the race I hadn’t noticed that my mile splits were slightly off the mileage posts on the course (I figured that out by mile 22). But I still had decent splits considering the wind resistance. Here are my splits. As I rounded the final corner for the last 2 miles on the boardwalk in Long Branch I looked at my Garmin and new I was sub 4 hours but wasn’t sure if I would be sub 3:55. So now it was time to focus. All the weeks of training had to pay off now. I buckled down and focused on the finish line….which was hidden around a bend and took forever to appear. Nevertheless, I skipped that final walk interval and picked up my pace and headed for the finish line. 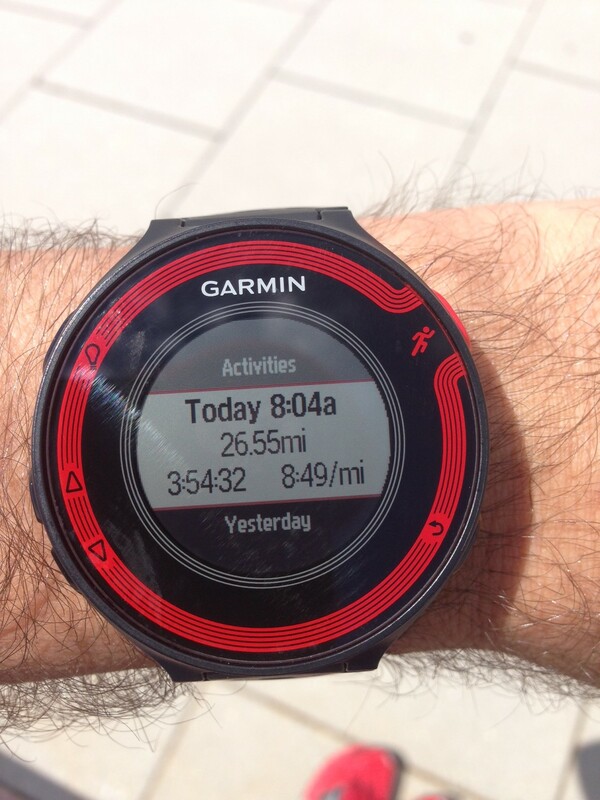 The clock shows sub 4 but as I started in Corral C that morning the truth was on my Garmin. Yup. I did it. I broke 3:55. My actual official time was 3:54:30. Then I got to receive an awesome medal. Spinners are always cool but this medal in addition to being a spinner also had the towns we ran through shown on the back. Pretty cool commemorative medal. I let my star shine today just like the medal said. At the finish line we received a bag from Panera Bread. I was quite excited as when we ran the San Francisco Half Marathon last June we received post run treats from Panera and they were yummy. This was a little disappointing. I know this is a much smaller race than San Francisco but in the bag was a breadstick (yeah…a breadstick) a banana and three pieces of salt water taffy. I have to admit I bought my own post race snacks. I have started doing that based upon my refuel needs. I bring along an Accel Recover bar and a Powerade. Just to have properly formulated fluids, carbs and protein. 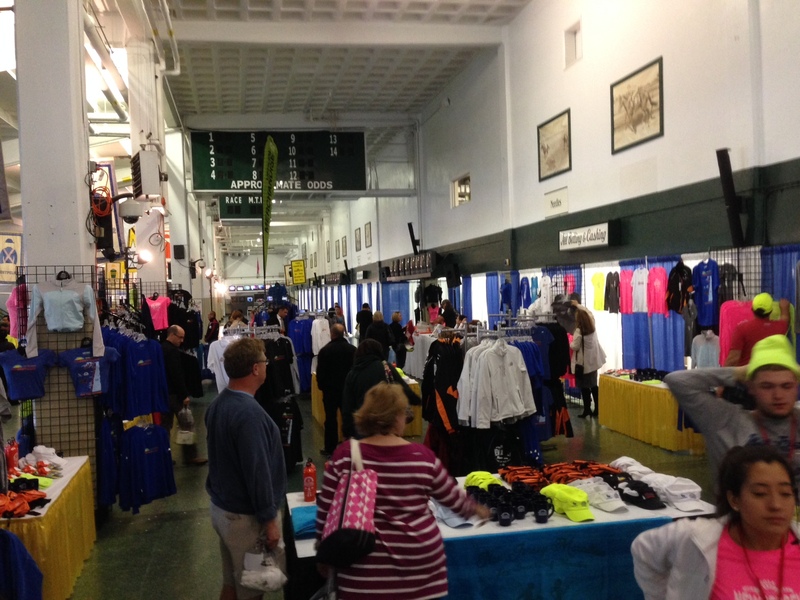 Once I picked up my gear bag it was time to take the long walk back to the race buses which would take runners back to the parking at Monmouth Park. Just like last year, althought the walk was slow it was the best thing I needed at the time to keep me from stiffening up prior to my long car ride home. As I was taking the walk back I passed by the finish line festival. There was plenty for the kids to do and also some merchandise for sale. I chatted with a couple of folks on the bus journey back to the start line and everyone seemed tired but in good spirits and happy with the day. I remember last year it felt the bus ride took forever but with a full complement of passengers and someone to talk to it passed relatively quickly. Now, remember above I mentioned the parking? 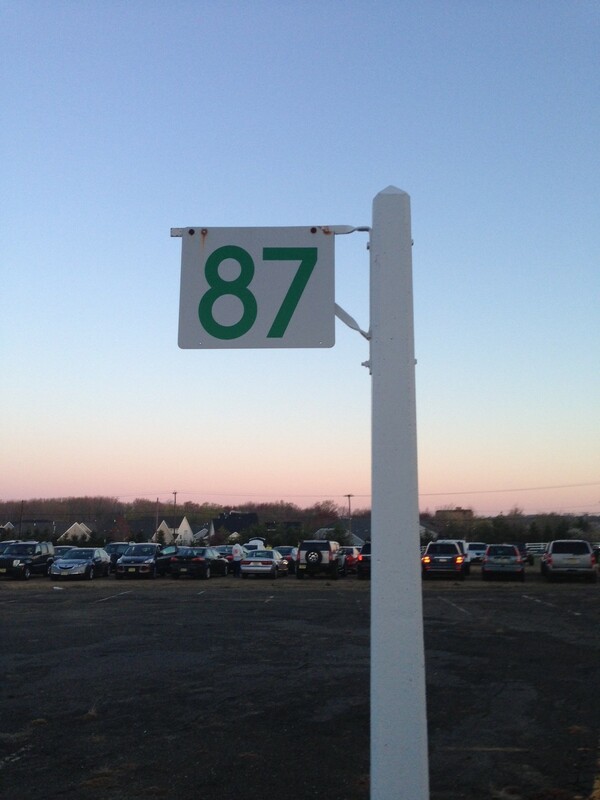 Well, I was parked at row 87. I have learned (unfortunately through experience at Disney races) to take a picture of where I parked the car so I can find it again. The bus dropped us off at row 1. That’s not too close to row 87. Sheesh…that was the toughest part of the day. Not too many folks walking with me by then so it was a loooooong sloooow walk back to the car. I did a good amount of stretching before I got in for the hour plus long journey home and actually felt pretty comfortable that I did. A couple of days after the race (hence the delay in posting) I had to have some medical tests done which I had put off because of the marathon. As a consequence I was not allowed to take any anti-inflammatory meds for the next few days so it was time for a nice soak in an ice bath (brrrrrrr….) to help soothe out the tired muscles. Luckily no one was home so they couldn’t hear me talk like a sailor when I got in. However, it worked wonders and if you can ever do it post long run I recommend it. Just keep the kids out of earshot. I had been in touch with John Thompson prior to the race and we had met up on the morning of the race. Subsequently he invited me onto the race recap episode of his podcast and we discussed our experiences together. I tend to talk alot (and write as much) so the episode was split into two parts. Here are parts one and two. Worth a listen. Also, here is the link to his blog and Facebook page. Thank you for the invite John. So, I PR’d. I am very happy with my time and it felt great but looking back I’m not on the long lasting high I thought I would be. 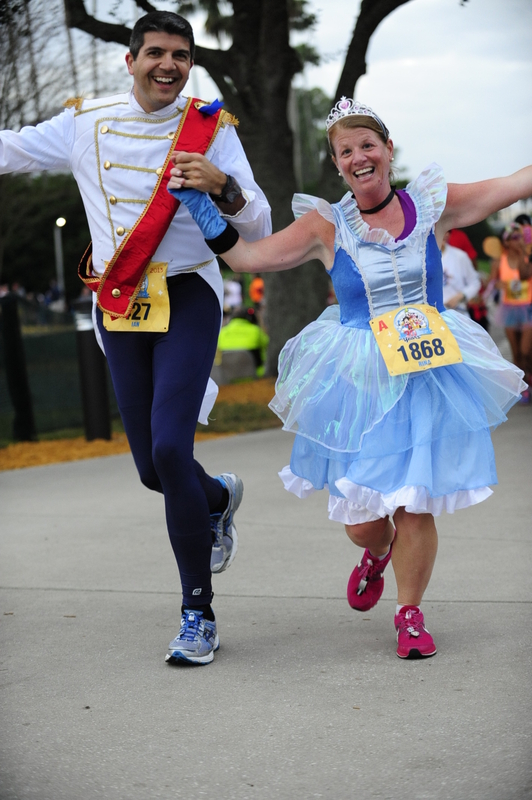 I was much more on a high finishing Goofy and Dopey and even when I completed the Disney Marathon in 2013 and Philadelphia Marathon in 2013 with my wife. PR’s are great but I think I get more out of the ‘fun’ of racing and the achievements than just times alone. Yes, I trainined hard and achieved my goal but in perspective I look back more fondly on the ‘experience’ than the time. I didn’t think that would always be the case. I’m kind of glad it is. Anyway, would I recommend this race? Yes. Would I go and do it again? Maybe but only if I was running with my wife or a buddy. There are plenty of other races on my wish list and I have had two great experiences running here. I think it is one to consider at this time of the year and the race director and his team do a fantastic job of running this event. It’s a nice day at the beach.